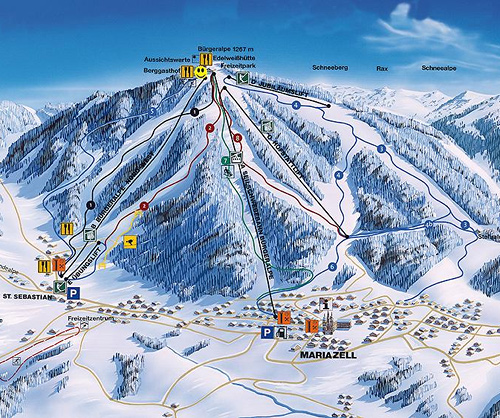 The mountain, which is attractive in every season 868 - 1267 m Styrian ski slope with Excellent grading. 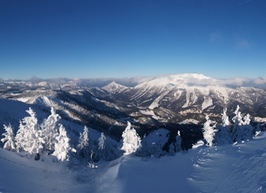 In winter it is a wonderful ski resort for families, with modern ski lifts and aerial lifts. It offers ideal facilities for leisure activities in summer for hikers, with the amazing views to the surrounding mountains and the “Lumberman Theme Park” on the mountain top is also an experience you should not miss. 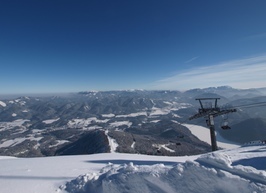 A wide range of choice on both ski resorts of Mariazell: possible leisure activities are skiing, carving, snowboard or hiking. 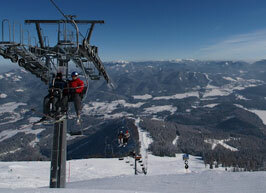 Modern aerial lifts take the guests to the regularly maintained ski slopes. The snow cannons guarantee the proper quality of snow on the slopes from December until Mid-March. Free ski-bus transports guests between the two mountains. Mariazeller Land offer manifold opportunities for sports and leisure time activities in addition to hiking and strolling or wandering: for highland bikers there are varied tracks and routes in every direction in the mountains. From the Alpentour Austria the Styrian cycling track the section leading to Vienna branches off here, and at the same time it crosses the Romantiktour route as well. The guests are conquering the realm of clouds by paragliding and microlighter aircrafts, experiencing the feeling of unlimited freedom. Those who love bathing can splash into the crystal clear water of the Erlaufsee or may choose to visit and have fun in the water at the free beach of Mitterbach. Divers can discover the depth of the lakes, kayakers and rafters can combat the drifts and flows of the River Salza. 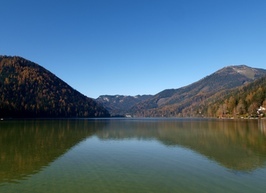 Anglers can challenge their luck in the waters of the Erlaufsee, the Erlauf-reservoir, the Walster, the Hubertus-reservoir and the wildly romantic River Salza abounding in fish. 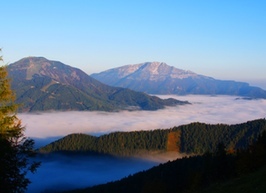 Mariazell Bürgeralpe with the “Lumbermen’s Theme Park” on the top and Gemeindealpe in Mitterbach are frequented destinations of hikers and excursionists. Both peaks can be approached with the aerial lifts easily. The fans of nostalgia trains may also find what they sought in Mariazeller Land: the narrow track of the Mariazell railway runs from St. Pölten to Mariazell, and the museum tramway in Mariazell goes to the Erlaufsee, representing the unique atmosphere of the railway transport in the past. 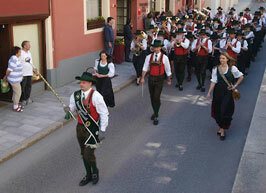 Visit the traditional celebrations during the period of Advent in Mariazell. Those who find Christmas is nowadays too pretentious or showy and less reflects emotions and affection, in Mariazell, will surely find again the values thought-long-lost. 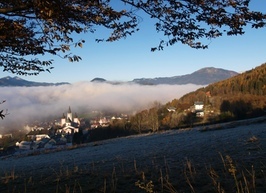 Mariazell - being the spiritual centre of pilgrimages and recreation for several centuries – spreads and fills the air with a very unique atmosphere during the weeks of Advent. The centre of the Advent Fair is situated in front of the immense edifice of the Basilica, where the vendors offer original Styrian products for sale from behind their stands built of pine wood. 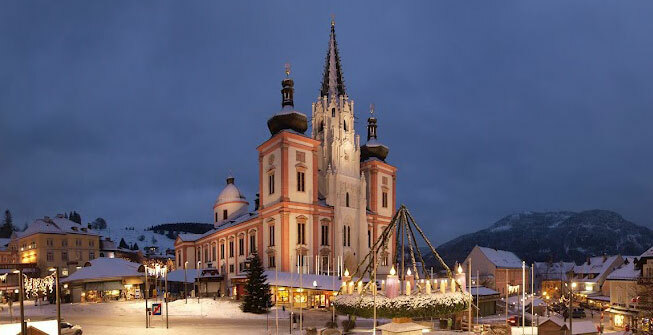 Spectacles from the world’s largest advent wreath thru the 5 m high house built of 1000 kg of real honey-cake, the live crib of Mariazell surrounded by oxen and donkeys, the Calendar of Mariazell and the railway of Mariazell, to the post office of Angels in Mariazell.